Below is an article that appeared in a local Arizona newspaper called the Foothills Focus which was published on October 26, 2016. 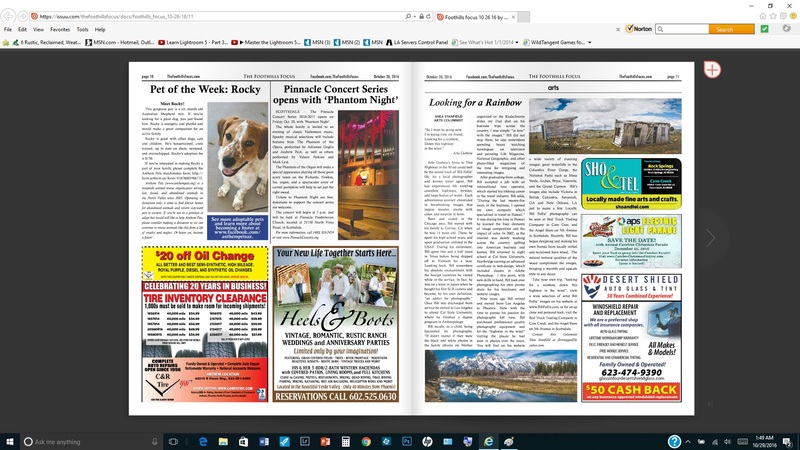 This newspaper circulates primarily in the upscale communities located in North Phoenix area. It is a summary that encapsulates briefly who I am and what I've been doing all of my many years on this planet. Shea Stanfield, the author of the article did a very good job describing who I am in this brief article entitled "Looking for a Rainbow"..
To get a more in depth understanding of many of my beliefs about "Life" generally, click here to visit my special website: www.TheRoadToEnlightenment.com. This is an online book of my Photos and Poems. I hope you enjoy it.